In a recent article I described how the scale length of the post Maccaferri Selmer Gypsy Jazz Guitar was increased from the original design. The reason Selmer did this was because (all other things being equal) a longer scale length creates more string tension which increases vibrations of the guitar top which makes the guitar louder. Guitar Volume Volume is greater for longer scale because of increased tension. Ease of bending string Less tension of shorter scale make strings easier to bend than long scale. Ease of changing the pitch of a note by bending. Shorter scale requires less string movement to increase pitch a fixed interval compared to long scale. Bending a string a fixed horizontal distance causes a greater change in pitch on a short scale instrument than on a longer scale instrument. UnitWeight is the weight of the string in lbs/inch. This is used instead of string diameter. You can download a PDF from D’Addario strings which provides this equation and tables of tensions and unit weights of different strings. We can simplify this equation to answer some questions you might be curious about. For example, what is the increase in tension if the same set of strings on a Selmer-Maccaferri guitar (650 mm scale length) is then put on a Selmer guitar (670 mm scale length). All the information we need is the tensions of the set of strings we are interested in and the scale length at which those tensions were determined (or calculated). Here is the data for D’Addario EJ84L Loop End Light Gypsy Jazz strings (0.010 – 0.044 inch diameters). According to D’Addario, all guitar string tensions in their tables are measured at a scale length of 25.5 inches. For this example I’m going to use the data below for the 650 mm tensions even though 25.5 inches is a bit short of 650 mm (646.4 mm). We don’t need to consider frequencies, unit weights or even unit conversions to determine what the tensions would be for the same strings on a 670 mm scale length guitar when tuned to the same. All we need to calculate is the factor we need to multiply the tensions by. The factor is the square of the new scale length divided by the square of the old scale length. The total tension will increase by 6.25% at 670 mm to be 149.7 lbs. There is no denying physics. 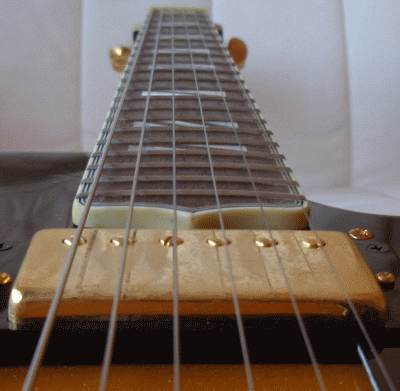 Increasing the scale length, all other things being equal, will increase the string tension. The same is true for the statements about the difficulty of bending notes between shorter and longer scale lengths. The important question is, does this really matter? The first observation to make is one is rarely comparing scale lengths in a situation where all other things are equal. Is an acoustic guitar with a 670 mm scale length louder than one with a 650 mm scale length? It’s hard to say. Are the woods used identical? Are the tops braced with an identical pattern? Are the sizes and shapes of the two guitars identical except for scale length? The answer to most of these questions is probably no. Most better guitars today are designed and optimized for different conditions and it is quite possible to find a shorter scale length guitar that is just as loud as another longer scale length instrument. The second issue is a matter of perception. Can you feel the increased tension that a longer scale guitar has compared to a shorter scaled instrument? Probably not. See the article Lutherie Myth/Science: Human Perception of String Tension and Compliance in Stringed Musical Instruments, at one of my favorite websites for guitar science and myth. The author, R.M. Mottola, describes an experiment done by the great jazz guitar builder, Bob Bennedeto. He made a guitar neck where each string had a different length but all were tuned to the same note using the same diameter string. No one could “feel” any difference in tension in spite of the laws of physics. So, does scale length matter to the guitar player? Maybe it does for you but it is clear that there is much more to consider than physics. Perhaps one area that I have not yet touched on can be said to be significantly affected by scale length. That is the relation between the size of the players hand – the length of the fingers, and the scale length. If you have small hands you might be better able to stretch to play difficult scales or chords on a guitar with a shorter scale length. Then again, it is easy to find players who simply adapted their playing style to fit the guitar they had and managed to learn to play as well as anyone else.